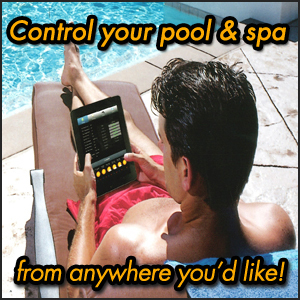 Without a doubt, operating and maintaining a pool or spa can be stressful at times, especially if you’re not a professional. Determining if what you’re seeing is normal or not, deciding to fix the problem yourself or call in a professional are all questions that come with the territory. Our company mantra is experience excellence for a reason. We don’t reserve our knowledge and expertise for only billable, in-the-field visits. Below, we share with you the basics of operating and maintaining your pool and spa, in hopes that you will become educated, feel empowered, and experience excellence with your backyard oasis every day. Q: How do I determine how many gallons my pool is? A: It’s important you know the size of your pool to ensure you are adding the correct amount of chemicals. To calculate the number of gallons of water in your pool, start by measuring the length and the width of your pool. All measurements should be in feet. To calculate the average depth, add the shallow depth to the deep end depth and divide by two. Q: How often should I test my water chemistry? A: Pool water should be tested minimally once per week. Specifically, it’s the chlorine, pH and alkalinity that should be tested on a regular basis. If problems with your water or chemical management persist, check the stabilizer, salt (if you have a salt pool) and phosphate levels. Q: What is the ideal level at which I should keep the chlorine, pH and alkalinity? A: It’s best to strive for a chlorine level of 1-3ppm, a pH level of 7.4-7.6 and an alkalinity level of 80-120ppm. Chances are you won’t be able to get all three tests to balance perfectly. 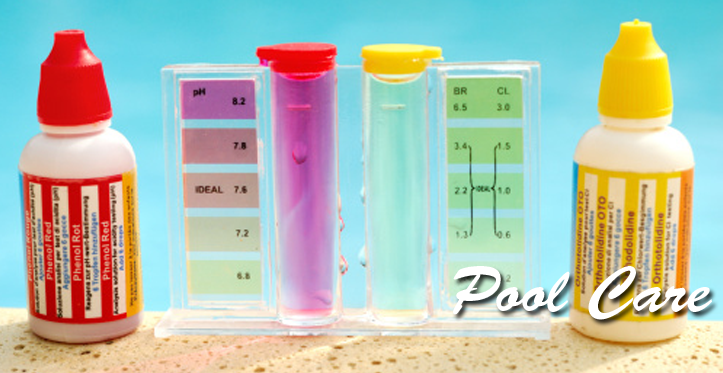 To get your pool water balanced as best as possible, focus first on getting your alkalinity level in the ideal range, then your pH level and finally your chlorine level. Q: What chemicals should I add to adjust my chemistry levels? A: To adjust the alkalinity level, use sodium bi-carbonate to raise the alkalinity level or muriatic acid to lower it. To raise the pH level, use soda ash or sodium carbonate. To lower the pH level, use muriatic acid. To increase chlorine levels, add shock. Always read and follow the chemical manufacturer’s instructions. Q: I have a salt pool, should my ideal water chemistry levels be any different than a traditional chlorine pool? A: There is no difference in the ideal chemistry levels. It’s still 1-3ppm for chlorine, 7.4-7.6 for pH and 80-120ppm for alkalinity. However, to ensure your pool water has enough salt in it to produce chlorine, you’ll want to test your salt level as well. The ideal salt level is 3000-3500ppm. Being in this range will give you sufficient salt content to create chlorine without the water tasting salty at all. Q: Why does my pool seem to go through more chlorine in the middle of the summer? A: The sunlight is more powerful than most people think. In the middle of summer, the sun’s rays are most intense. Additionally, air temperatures and humidity levels are also at their peak. These factors will “burn” chlorine out of a pool much more quickly than during the spring and fall. For this reason you will likely need more chlorine than usual. If you have a salt chlorine generator, you’ll probably need to increase chlorine production levels to compensate. In order to keep chlorine in the pool, your pool water needs a chlorine stabilizer level of 15-30ppm for traditional chlorine pools or 50-80ppm for salt pools. Q: What should my filter pressure be? A: Every pool is different. In general, normal filter pressure ranges from 10-20 psi. When your filter pressure rises by more than 10 psi, it’s a sign that you need to backwash your filter. An abnormally low filter pressure is a sign that there may be an obstruction hindering water flow. Q: When am I supposed to use DE? A: Diatomaceous Earth (DE) is only used with DE filters. It is essential you add DE every time you backwash your filter. Check the product label for the correct amount to use for your filter size. (In most cases it’ll be 6lbs.) To add the DE, open the skimmer lid on your deck, and put the DE into the skimmer while your filter and pump are running. The water current will carry the DE to the filter, and coat its internal filter grids. Q: Should I have a pool service maintenance company? A: If you are unsure of how to maintain the pool or don’t have the time, we are happy to teach you the maintenance routine or do it for you. Also we have several maintenance options available. Contact us for details. Complete maintenance service and chemical and operation checks are available on a weekly, every other week or monthly basis.